Wilcoe, Texas, AKA Wilco Texas. Kansas ranching brothers James Edward and Frank B. Wilson arrived here (with other families) around 1907. A third brother John, and his wife assisted the others with planning a new community. A store was opened by the Wilson family and not far from their ranch headquarters, a combination school and church were constructed. They also laid out a park and started selling lots. The future seemed bright for Wilcoe since a railroad (the Enid, Ochiltree, and Western) was headed their way. 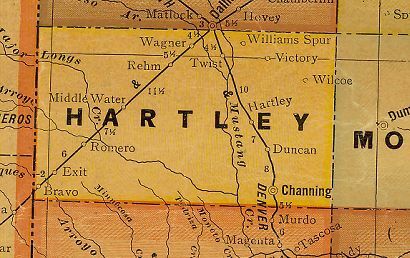 Tracks were completed from Dalhart to Wilcoe before the idea was abandoned. The curtailed line did make connections to other lines and was in operation until 1911. The 1940 census could count no residents other than a few remaining members of the Wilson family and only the public building standing that year was the school. After WWII the Wilsons moved to Dalhart. The Wilson ranchhouse is said to have been occupied by descendants of the founders. A grain elevator serves as a landmark to the town that might have been.